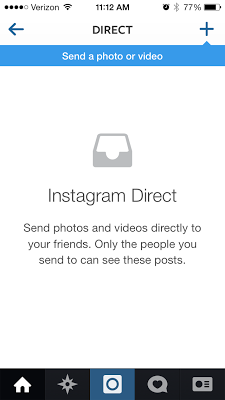 With Instagram's new direct messaging feature in their latest update, this ranks them into a real social media contender with other private picture messaging apps like Snapchat in the dark. This creates many new options and avenues for brands, in addition to competing with other brands in the photo sharing. I believe with this new update, Instagram will now seriously compete with Snapchat and may have the ability to make it a thing of the past. So 2013! Instagram has over 150 million users, so this will now open the door for all those people that didn't want to use Snapchat, myself included. It seemed Snapchat was channeling the younger crowd to send "not so appropriate" photos to one another, but maybe Instagram can be direct messaging back with some class. Direct messaging for Instagram will allow real photographers the ability to connect with others and share unique photos. It can also allow couples to share photos with one another, without others seeing through Facebook. And of course, there will still be "nudie" photos, no way to get around it. Is Instagram Still Playing Catch Up? After Vine came out, Instagram hurried to create a video feature, not as successful, but still they ranked up there with video sharing. Now is Instagram "catching up" to Snapchat with a vengeance after the turned down offer? While Snapchat has many users that know the app for a private photo messaging app, Instagram has the higher user base that now has access to that same exact feature without downloading an additional app. Also remember that earlier this week Twitter had an update for streaming photos in direct messaging too. Like +Ian Andrew brought to our attention when the new release came out for Twitter direct messages, will this new feature for Instagram catch on? If Instagram continues to play catch up with everyone else, won't they eventually be always "yesterday's" app? Does This Open Up For More Media Spam? With this latest update, does this open a door for more bots and spam media to be thrown around to ruin a user's experience? Instagram has been very hush-hush and laid back on the potential advertising that brands will begin to embrace in the upcoming year, however, will this new feature get out of hand. I'm thinking of the direct messaging problem that Twitter has always dealt with automated direct messages. I know that Instagram is a difficult network to automate, but will this just keep the spammers to continue to work harder to reach us. What Does It Mean For Brands & Marketing? Now that Instagram has this option of private video and picture messaging, this creates a whole new marketing option for brands and connecting with their audience. Some options that I can think of off the bat is audience members sending pictures to their favorite brands for contests, picture boards, and more. What do you think about this new Instagram update? Benefits? Negative Effects? What about it's effects it is going to have on marketing? Here is what Instagram posted about their newest update on their blog.